I’ve been a bad, bad person. Not only have I been neglecting my blog, but I haven’t been getting a lot of writing done, either. I could lie and make up some excuse about how life has been busy (it has, and the City of Aurora, with its draconian yard maintenance rules, hasn’t helped in that respect), and that I’ve been sick a lot (two bouts of flu and one of norovirus, ugh! ), and that my netbook has been needing some maintenance (it’s five years old now, and sometimes cranky). But the truth of the matter is that none of these are the real reason I haven’t been writing much. No, if I’m being brutally honest, the real reason I haven’t been writing much is because I gifted myself with an inexpensive Android tablet at Christmastime, and then my employer gifted me with an iPad at about the same time, and, well, I’ve been playing games. A lot of games. Beloved Husband got an Android tablet, too. And for a couple of weeks, we obsessively played Tiny Death Star morning, noon, and night. Oh, there were some short bouts of Angry Birds and Angry Birds Go! But TDS sucked us in. Beloved Husband lasted longer than I did. I got tired of how long it took for anything to happen. 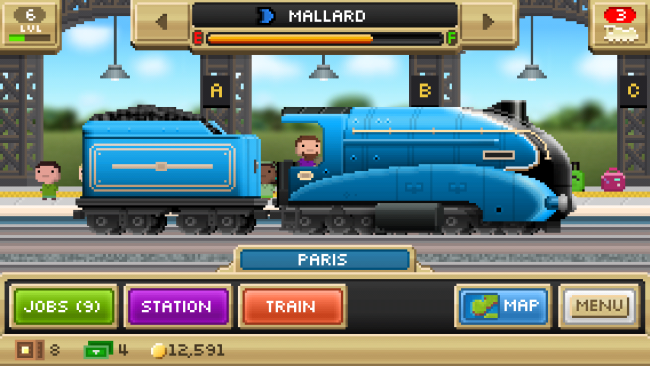 And then I stumbled upon the worse obsession: Pocket Trains (from the makers of Tiny Death Star). I don’t recommend either of these games to anyone who is trying to write in their spare time. Because these games will make sure you don’t have any spare time. It all just gets sucked away. So I think the time has come. Time to put down the trains and pick up the keyboard and start writing again. This entry was posted in Writing and tagged finding time to write, finishing what I started, focus. Bookmark the permalink. I know just what you’re saying. I went through a similar bout a while back. Not games, but social networks and stress. I finally got back into the game when I realized what I really wanted to write and stopped making it so serious. Since then, it’s been better, though I always feel backlogged. I’m glad to see you back, too. And I miss Celia Winterbourne!